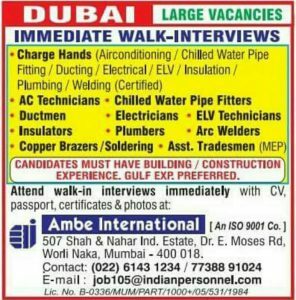 Hope this is the best opportunity for gulf job seekers in Mumbai .One of the leading consultants ambe consultancy khar road in Mumbai is posted huge list of gulf jobs to gulf job seekers. ambe consultancy vacancies 2019 JOB OPPORTUNITIES For LARGEST SHIPPING COMPANY IN MIDDLE EAST. here list of gulf jobs from ambe consultancy services pvt. ltd. Client interview details is given below for ambe consultancy gulf jobs. MIN 4 YRS GULF EXP & ABOVE. Walk-in with Original Passport, 2 sets of CV’s, Photograph & all documents. Looking for heavy bus driver job for Quattar .uea licence 3’5-6 11 yrs. Experience. Sir i am piping draughtsman experience with Dodsal engineering and construction company. i am search new job.